The controls on any piece of heavy equipment act as its central nervous system, firing electrical signals that turn lights on and off, extend booms, turn concrete mixer drums or raise and lower buckets. In order to make sure everything functions as intended, however, it’s crucial that the controls are labeled properly. If they aren’t, the OEM could be liable for any injuries or damage that stem from improperly labeled controls, not to mention the guilt of an easily avoidable accident. 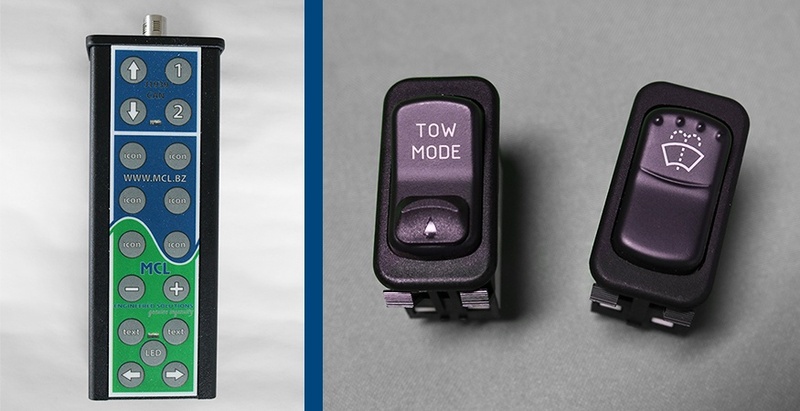 When it comes to labeling controls, there are two popular methods that OEMs can choose from: decal overlays or labeling each switch individually. While there is no “right” or “wrong” way to label heavy equipment controls, there are several things that need to be considered during the design phase before choosing which route to take. Decals are highly customizable. OEMs can choose how thick the decal needs to be, what kind of material it should be made out of, what kind of adhesive to use and even the type of ink that should be used – all based on the working environment the controls will be exposed to. Because digital printing is becoming more readily available, the lead time on decals can be as short as one day, and minimum order quantities are becoming a thing of the past. Depending on who you partner with for decal printing, you may or may not have to put in more time initially to design the decal. As you design it, however, you can group similar controls together using colors to differentiate groupings or integrate your company’s brand into the design, enhancing the overall aesthetics of the machine. Your decal supplier may also offer design services to help you out. If you need the controls to include backlighting or indicators, be sure to include that in your design and work with your decal supplier to ensure the placement is correct and that the decal material will be conducive to backlighting. Aside from labeling controls, any blank space on the decal can be filled with a legend for control groupings, operating instructions or warnings. Unlike decals, labeled switches don’t require much forethought and you can procure many different kinds of switches with countless icon options. Typically, it’s easiest to find rocker switches with labels; however, there are some labeled push buttons available. Looking at how they’re made, labels are typically laser etched or screen printed and both options are quite durable. Plus, you’ll find backlight options on nearly every rocker switch out there. Since these are the actual control switches that you likely order through a distributor, they are subject to longer lead times and minimum order quantities. Therefore, it’s probably not the best option if you only need them in small volumes. The size of the switch will also dictate how much information you can include in the label. In general, when labeling the controls on heavy equipment, it’s better to use icons rather than text. Not only are most icons universal, but they will also save space, making it easy for end users around the world to operate the machine. The most important consideration when deciding how to label controls is the working environment. Will the controls be used outside and exposed to sunlight, rain or snow? Maybe they will be exposed to acids, fuel or hydraulic fluid. It’s also possible to mix and match your control labels, using a decal for some and labeled switches for others. When in doubt, consult your supply partners and ask for their advice. These are the types of decisions that MCL helps customers make on a daily basis. Learn more about how we become a true partner to our customers by reading our case study, Ticket Redemption Game Developer Increases Sales with Help from a Contract Assembly Partner. Click the button below to read it now!